Unlike the recent batch of five parks where the old name was a strong contender, I doubt MM is even nominated here. From an outsider’s perspective, it doesn’t seem to have anything going for it, even if it’s now been the name of the place about 8X longer than it was called Enron. Distinctive Features:The train honoring the site’s history as Houston’s Union Station; the left field wall scoreboard below the Crawford Boxes; Home Run Pump in center, tallying Astros homers hit in the park since its opening; Tal’s Hill and flagpole, (2000-1916), the 30-degree incline and in-play pole, both cursed by a generation of NL centerfielders. Looking to close out the series, Brad Lidge gave up the Holy #### Homer to Albert Pujols to keep the Cardinals alive in the rematch of the 2004 NLCS. Two nights later, the ’Stros would win Game 6 in St. Louee to earn their first Fall Classic appearance. On Opening Day 2013, the tank-mode hosts accidentally beat visiting Texas 8-2, marking their first game in the American League after 51 seasons in the Senior Circuit. A large part of BBC died that day. The old ballparks in Houston were called Herald Park, West End Park, and Buffalo Stadium (their Texas League team was the Houston Buffaloes). None of these are too resonant or promising. The NL franchise began life in Colt .45 Stadium, which had a weird history: it was both temporary and modular, and after the Astrodome was built, Colt Stadium was taken down in pieces and shipped to Mexico to form parts of other stadiums there. But again, unless you're going to rename the team Colts or Buffaloes (Colt .45s being probably too outré even in a hardline Second Amendment state), none of these names make sense for re-adoption. The Astros play there, and it's a dome. Therefore the only logical name for the park is The Astrodome. 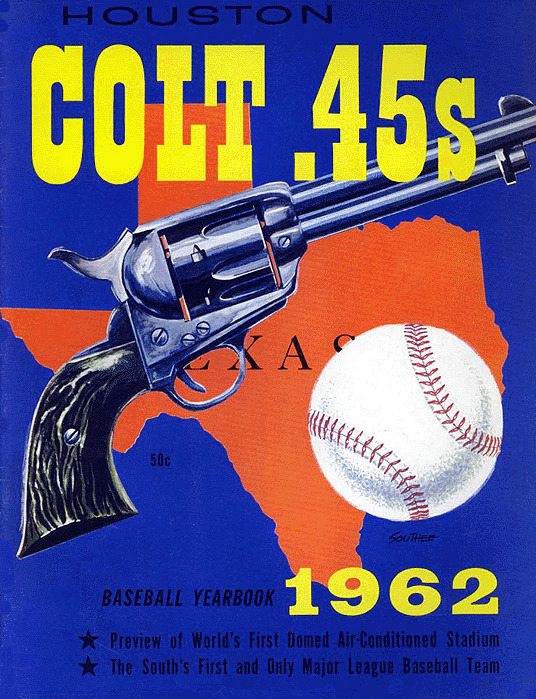 Now what in the hell is wrong with the Houston Colt .45s? But okay, I'd stick with Minute Maid. I'm not a fan of corporate names, but at least it's not a tongue twister or a tech company. I like The Juice Box as a nickname, but it's a bit informal. Bagwell Ballpark - not a fan of naming them after players. Black Gold Ballpark. Houston's big in the oil/energy industry, right? Aerospace Stadium. The space program is part of the city's history & a distinctive feature. Astrodome is already taken. The Ninth Wonder of the World. Not really - but it does refer back to the Astrodome. Station Grounds or Railway Grounds, owing to the proximity to Union Station. It seems we do need a grounds somewhere in this exercise. Bump to squeeze out some more noms. Ugh. I wish I knew the first thing about Houston. I don't. Has anyone nominated something boring like Astros Park? Ugh. I wish I knew the first thing about Houston. The park appears to be near Buffalo Bayou, a cool-named river running through the city. How about Astrodome 2000? It actually opened in 2000, it makes it clear that it's an updated version of the old dome, and it has an agreeable Tomorrowland feeling to it. Are we memorializing the death of her fandom? It may be silly, but I actually like this idea a lot. If it gets named "DH Park", it won't be just Lisa's fandom that died a premature death. I like Astrodome 2000, too. I am normally really against any name that sounds 'silly'. Another vote for Astrodome 2000. I agree with Astrodome 2000. A/C Park. If not, I too like Astrodome 2000. Re: Houston, it is hot, it is unbearably humid (for people like me), it sprawls everywhere, but it really does have an amazing vibrant dining scene. I'd also say behind NYC/LA and probably Miami, it feels the most International of any U.S. city. I suppose it should as it will surpass Chicago in terms of city population here before too long.